To set a marketing budget for your self-storage operation, you must have a plan of action for your marketing efforts. If not, you’ll waste valuable resources on strategies that bring little to no results. The overarching goal of marketing should be to ensure potential customers know your brand. The better your brand visibility, the more likely prospects will think of you when the need for storage arises. This can be particularly true if you’ve created and promoted alliances with local organizations and businesses. You want to become a trusted community resource, emphasizing your position with frequent testimonials and networking. To get the whole neighborhood talking about your store, you need to leverage referrals, engage social media, participate in community organizations, visit local businesses, host onsite events, and post online reviews. Your outreach should include e-mail campaigns, direct mail and many other methods to increase your contact database. All these efforts tax your resources in different ways and require thoughtful planning and measurement. To understand how all the pieces of a marketing budget work together, let’s do a little reverse engineering, using a benchmark example from my property-management company. My firm uses an in-house “Personal Marketing Goals” (PMG) form for each facility in its management portfolio. It’s a one-page worksheet on which we list the goals for each marketing activity and then measure performance against them. PMGs are completed at the end of the year, coinciding with overall budget planning. In 2017, our teams sent an average of 35,234 marketing messages per store through outgoing calls, e-mails, weekly visits to local businesses, onsite events, social media posts, club meetings, expos and other off-site networking. Our facility managers made more than 23,000 visits to local businesses. Nearly 41,000 visitors attended events at our properties; that’s more than 1,000 visitors per store for the year! All these touchpoints help a self-storage operation gain visibility and build reputation, which should result in unit rentals. A good way to determine their effectiveness is to calculate your average cost per lease (CPL) by dividing all advertising costs by the total number of new leases. In 2017, our CPL was $65.74. To get to a set of budget guidelines, let’s drill down at what my company spent on marketing in relation to other expenses. The following table shows a decade of expenses expressed as dollars per square foot. Marketing costs are represented in the “Advertising” line. This includes all our efforts, from promotional items to candy giveaways. In 2017, our marketing expenses were 25 cents per square foot. Our facilities average 60,000 net rentable square feet, so if your property is smaller, this number will be larger. 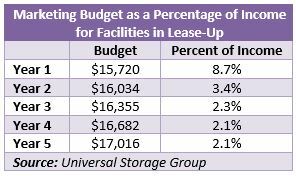 Conversely, if you operate a much larger facility, your cost per square foot will likely be less. Events: Expenses for participating in or hosting events, including ribbon-cuttings, yard sales, chamber expos, etc. 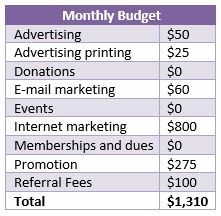 In the following example, we’ve allotted $1,310 per month for all these items. Since we place our emphasis on outreach, our three largest costs are referral fees, promotion and Internet marketing. These comprise nearly 90 percent of our monthly marketing output, with Internet marketing alone consuming 61 percent of the budget. Keep in mind these figures will differ between a new facility and an average, stabilized location. In the following example, you can see a progression during lease-up in which marketing should require a lower percentage of income despite an anticipated, annual escalation in associated expenses from the first to fifth years. List any marketing and advertising expenses in your management software. For example, if you’re a member of your local chamber of commerce, make sure that’s listed. Similarly, track performance across all channels to gauge effectiveness. This includes surveying new customers at move-in. It’s critical to confirm how a new tenant found out about you. Ensure your managers are using a marketing questionnaire at move-in and registering responses. The results will help you figure out what’s working and how to adjust and allocate marketing dollars for future budgets. The following table shows how our teams measured sources of customer traffic last year. At just .01 percent, it’s apparent the Yellow Pages is no longer a valid source of acquisition for us. On the other hand, with nearly 34 percent of new tenants citing the Internet as their point of contact, we must have an adequate budget for our business website, online aggregators, PPC campaigns, social media ads and e-mail marketing. Engaging your customers and community members is critical to being top-of-mind. By planning your marketing and then working and measuring that plan, you’ll be able to adjust your annual budget with confidence, knowing all your touchpoints are working toward your bottom line.